What is included with our accommodations? ~ We usually have some kitchen staples like simple spices, oils and condiments, foil and plastic, but we do not guarantee anything. ~ RESORT SHUTTLE, takes you anywhere on Kapalua resort property and picks you up and drops off at your door. ~ We promise, No Hidden Fees with Platinum Maui Vacations! Check-in time is 4:00pm and check-out time is 10:00am unless other arrangements are made. It may be possible to check in earlier if there is not a departure the same day. We do our best to accommodate all. We can receive groceries and bags earlier and call when the villa is completely ready. Can late check-outs be requested? As to late check-outs often requested, they are considered on a case by case basis and depend on the schedule of incoming guests and housekeepers workload. IF we do not have another guest coming for several days and IF housekeeping can fit the change in their schedule we allow a late out until 2:00pm with no charge. Beyond 2:00pm up until 8:00pm, we charge a ½ day charge which is ½ of the standard rate. Beyond 8:00pm would be an extra night charge. Are guaranteed late check-outs available? Guaranteed late check-outs can be arranged upon booking on a case by case basis but are typically not done during high season unless a shorter un-marketable gap exists on the calendar. Guaranteed late check-outs are billed ½ day charge and added to the collective cost of the reservation. Is daily housekeeping services available? Cleaning service is offered prior to arrival to ensure your vacation home is cleaned before you get there. Daily housekeeping is available at your request for an additional fee. How long does it take to walk to the beach from the villa? Walk time to the beach varies depending on which villa you’re staying in, which beach your walking to, whether you’re in the Bay or the Golf Villas and how fast you walk and you’re level of fitness but on average the walk is anywhere from 5 to 15 minutes. Keep in mind you may want to utilize the beach chairs, a cooler, umbrella and maybe a beach bag with snacks so the shuttle is very convenient especially on the way back after relaxation has set in. We provide a walking map prior to check in. Kapalua is on the west side of the island of Maui. Northwest facing if in the Bay villas and more due west if you’re in the Golf Villas. How long does it take to get to Kapalua from the airport? The main airport is in central Maui, Kahului or OGG airport. It’s approximately one hour to Kapalua once you leave with your rental car. A typical rule of thumb is 2 hours from airplane touchdown to Kapalua if there are no traffic snags or stops along the way. There is a smaller airport called the “Kapalua airport” for inter-island commutes. Costco members can find the grocery shopping and gas adjacent airport property in Kahului, Maui now has a Target for those without a Costco membership. Whole foods in Kahului offers great selection of Organic foods. For those wanting a smaller and shorter visit, the Foodland Farms, Safeway and Times markets are on Hwy 30 in Lahaina, 15 minutes from Kapalua. 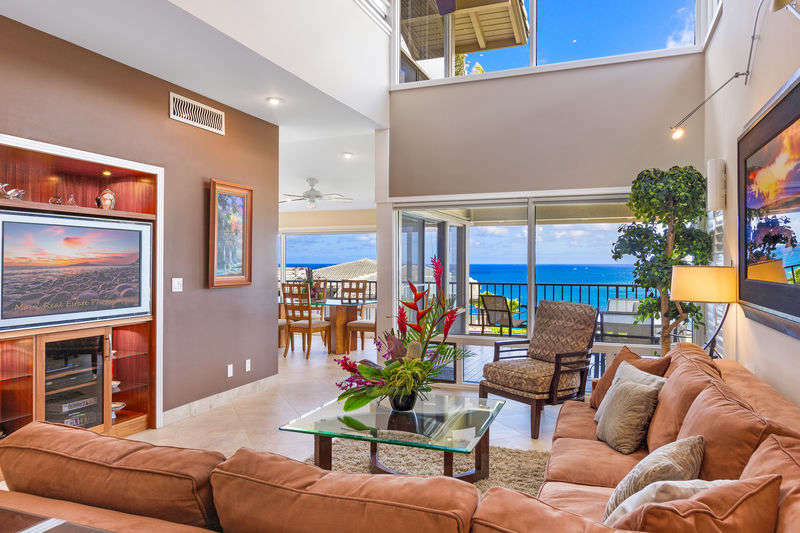 There are also smaller markets like Napili Market and the Honolua Store within a couple minutes of either of the villas. When do the whales come? The first whale sightings of the year typically take place in early October. The peak of whale-watch season is typically in February and March. Some whale-watch excursions guarantee sightings from November 4 until May 15 then the sightings taper off to the end of May until next season.